No matter how much I talk about whole grains, bread, my bread machine and bread-making, y’all always seem to be interested in learning more! And I also make a lot of jokes about my kids’ stomachs being like bottomless pits. My kids are for real hungry ALL the time. As soon as they are done with their breakfast they are asking what’s for snack. Not even that they are hungry right that minute, but they just want the blessed assurance that snack time is coming. I’ve been really, really busy the past year or so – especially in the last 3 months. I cannot keep my children full if they don’t have whole FRESH grains. I just can’t! They will eat me out of house and home. Anything from the store, “healthy” breads, waffles, etc. The kids were hungrier and they were eating more! 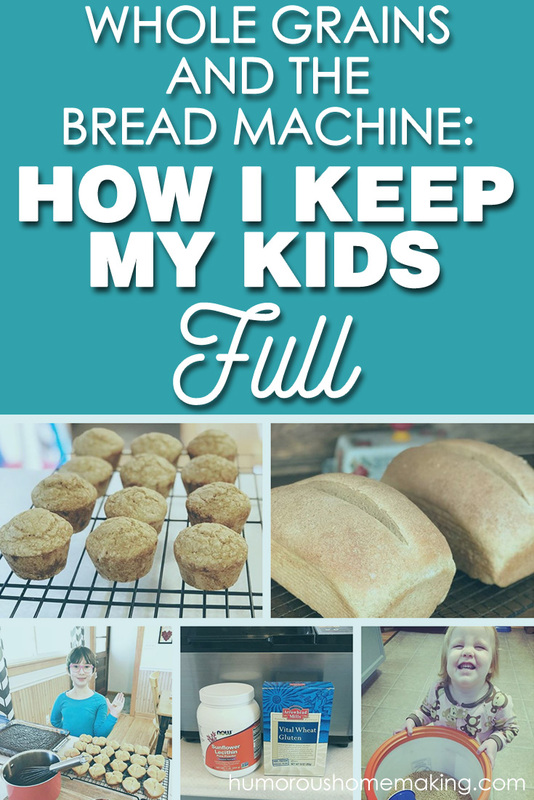 But I realized that when I use my bread machine regularly and make as much as I can from whole, fresh grains, my kids are more satiated. This is the best way to keep them full! They don’t ask for as much to eat. They act happier. It’s easier for them and for me. Store-bought snacks just made my kids hungrier, which made more work for me! I don’t eat as much of the breads and muffins as my kids do. 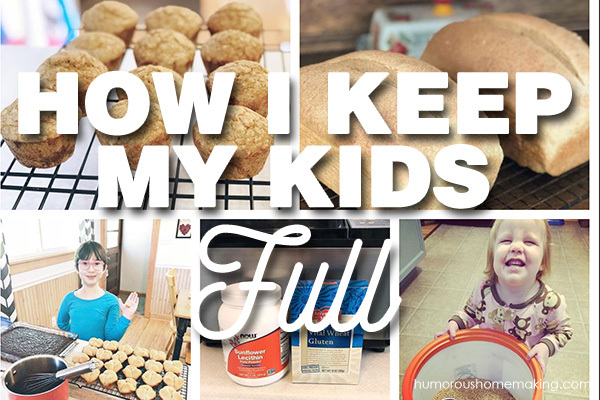 But I try to ALWAYS have plenty on hand to keep my kids from being full. I love my Nutrimill – it has been such a game changer for our health. People always ask if making your own flour takes extra time. The answer is no, not really. Why? The grains are literally grinding while you are getting everything else ready. And I also love my bread machine…and I don’t even bake the bread in there! I just love that I can throw the ingredients in there, walk away and come back to find I have dough ready to go! You don’t have to have a bread machine to make bread. I made bread for 10 years before I got one. But if it’s in the budget, it sure does make life easier! Easier for me to get the bread in the pan, bread in the oven, bread on the tables and bread in their tummies! The recipe that I always use in the bread machine is the Bread Beckers Basic Dough recipe. Some people don’t like it – bread changes based on climate, altitude, humidity, etc. so you need to find one that works for you. This is just the recipe that we’ve settled on and that we like best. Warm Water first. I don’t use the warm setting on my bread machine. I think it gets too hot. But I always use warm water in the bottom of my machine. Real salt comes next. I love Redmond’s Real Salt because it still has the minerals in it! Never put the salt and the yeast near each other. They are not friends. Grapeseed, olive or avocado oil and also honey are added to the warm water. You can technically leave out the honey, but I like the sweetness it gives the bread. If you don’t use honey, you will need to add about a 1/3 cup of water to make up for it. Next, comes the sunflower lecithin – or you can use soy lechitin. This makes your bread soft and less crumbly. It helps it hold it’s shape and structure while still being tender. Last ingredient before the flour is the vital wheat gluten. I always add this whenever I grind my own flour because it helps to my bread get a better rise. For some reason, fresh milled flour needs a little boost. Then comes the flour – glorious fresh milled flour! 3 cups of fresh grains makes about 4 – 4 1/2 cups of flour. After I scoop in the flour, I always smooth it out and then make a little crater in the middle for the yeast. The yeast is the very last ingredient that goes on top of everything else in the bread machine! I always use Fleischmann’s yeast that I buy in bulk from Sam’s Club. I’ve tried all kinds and it is my favorite. I store in the freezer – it keeps longer and you get a better rise in your dough. I promise this whole process takes 5 minutes or less – and the hands on time is almost nothing! I always start my bread early in the morning with the goal being to have it out of the oven and cooling by lunch time. I don’t like to cut the bread until it cools but the kids like it squished and warm. My kids go thru 4 loaves of bread a week! And their absolute favorite way to enjoy fresh baked bread is with Trader Joe’s Organic Super Fruit Jelly. It’s a winner! Do you make your own bread? If not… what are you waiting for! ?